Sony brings its intelligent clock earlier than planned (expected by mid-November), becoming one of the first manufacturers to sell a product with Android Wear. The new Sony SmartWatch 3 will be available from November 4 for a recommended price of 229 euros. The Sony SmartWatch 3 is a discrete device, lightweight (38 grams) and a 1.6-inch display. Among its features are worth highlighting the IP68 certification which ensures resistance to dust and water, and its battery of 420 mAh, which guarantees two days of autonomy. Internally, this smartwatch is based on ARM A7 quad-core processor at 1.2 GHz with 512MB ​​RAM and 4GB eMMC storage. The incorporation of GPS will allow go running without load with your smartphone (something that will not make the brand-new Apple iWatch) and details such as the light sensor, integrated compass, a 9-axis gyroscope or NFC support make it an option worth interesting for those who want to sign up for this new technology trend. The software is responsible for the operating system Android Wear, a powerful solution for Google with all that advanced users expect including a complete notifications system, integration with other devices, possibilities of customization and an interface specially adapted to display with small diagonals. So far the biggest criticism has been its high consumption, which should be mitigated in future updates. 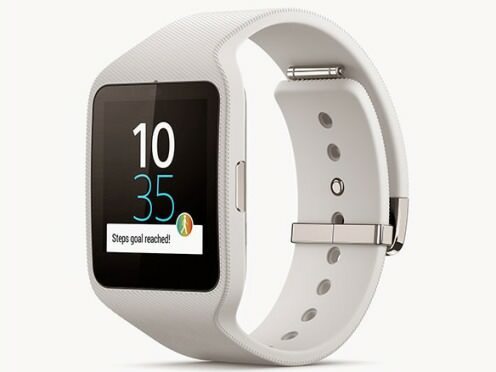 The Sony SmartWatch 3 can be booked from online stores and begin sending the 4th of November for 229 euros. That day should also be available in the network of official distributors. The package includes the watch, a strap (you can buy other separately), USB cable and quick start manual.